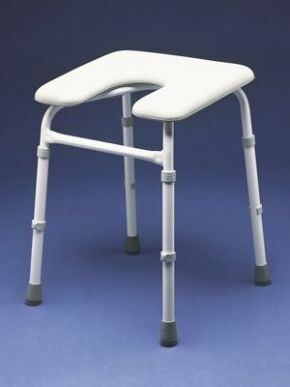 Padded Adjustable Height Shower Stool Non Slip Feet. This Chester Padded Shower Stool has adjustable legs so can be set to exactly the right height. The steel frame is epoxy-coated for corrosion resistance and it's strong enough for users up to 190kg or 30st. Each leg ends in a non-slip foot. The construction is of the highest standards. A shower stool with a cut-out panel makes personal cleansing easier and reduces the need to move around while sitting. This is a good quality choice that offers comfort and adaptability. I purchased this for use in the shower and I found this to be a lot better than others I have had in the past. Very padded and comfortable and good quality.